The Italian Chamber of Commerce in Hong Kong and Macao had the pleasure to present: TRUE ITALIAN TASTE – Cheese Tasting, Wine Pairing & Networking, a dedicated event within the project TRUE ITALIAN TASTE part of the campaign “The Extraordinary Italian Taste” promoted and financed by the Italian Ministry of Economic Development and implemented by Assocamerestero in collaboration with the Italian Chambers of Commerce abroad. 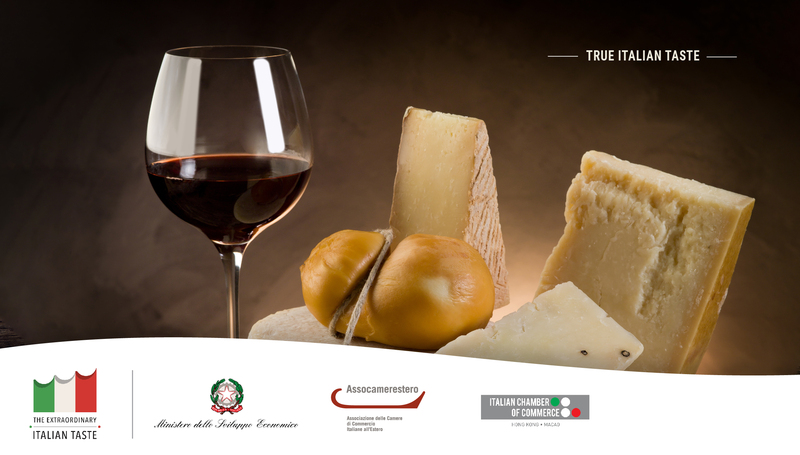 True Italian Taste is an initiative that aims to raise awareness on the benefits deriving from the use of authentic Italian DOP and IGP products and to increase their consumption in foreign markets. On February, Wednesday 27th, our guests had the opportunity to indulge in a delicious selection of Italian cheeses enjoying a spectacular set of wines at Conrad Hong Kong. They learned how to recognize authentic Italian cheese (DOP, DOPG, IGP) and how to pair specific types with different kinds of wines while discovering the exclusive Conrad Hong Kong Cheese Library. They had the chance to meet Cheese Library Curator, Ronal Massink, and found out all the secrets of wine pairing with Concetta Centanni, from Watson’s Wine. Restaurant Specialty Chef, Riccardo Catarsi and Executive Chef, Claudio Rossi, prepared a delicious Risotto Gorgonzola, Pere e Noci and the renowned Cavatelli Cacio e Pepe, in order to make this journey truly Italian.